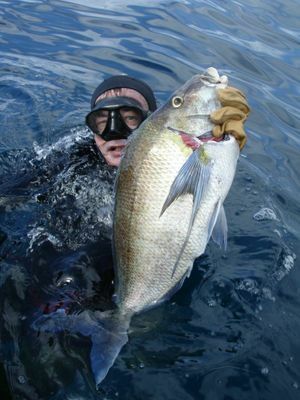 Spearfishing isn't just a means of catching a feed. To most of us who do it, it's a deadset lifestyle, and when you're not on a dive, you're mentally planning and counting the minutes until your next one. Just like 4WD touring, traditional line fishing, or motorbikes, the line between hobby and obsession tends to get blurry pretty quickly. One of the great things about spearing is that it isn't expensive to get into. A dive mask, a snorkel, some fins, a homemade float and a hand spear and you're set. Of course as you get more into the sport you can upgrade your gear and invest more heavily in a quality speargun and a good wetsuit among other things, but for starting out you can get in the water and land decent fish for under $100. Not bad eh? However, before you rush out to your local headland via the dive shop, there are a few things you should know. The first is education. Knowing the species you can legally target and areas you can legally take fish is of paramount importance. 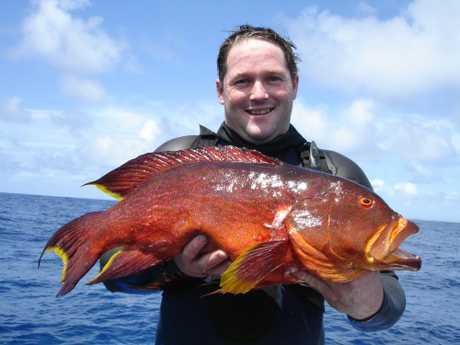 For example: taking fish from a marine park or spearing a Blue Grouper is highly illegal (at least in eastern states - in WA they're fair game) and is frowned upon both by fellow divers and the authorities, so ask at the dive shop or jump on your state's primary industry website before you expose yourself to unnecessary risk. Once you're set, it's time to get into the water. Reef systems that can easily be reached from land are often the best places to start out as they offer plentiful targets and it's not too difficult to get back to shore if you become fatigued. Reefs are just about universally beautiful places to dive too. You can interact with all manner of marine life here while you improve your diving skills, and at the end of the day it's just plain old good fun! We've never met anyone who has been bored while diving - they're too busy having a good time. 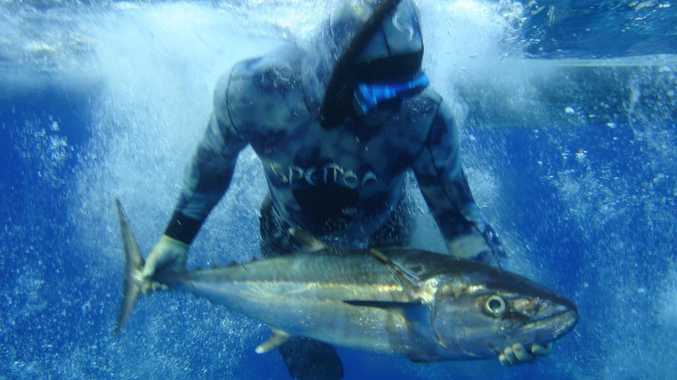 This article will get you started on the basics of spearfishing and introduce a few things that you need to know. So if you're ready to try something that's going to make you fitter, happier and get more fresh seafood into your diet - keep reading! 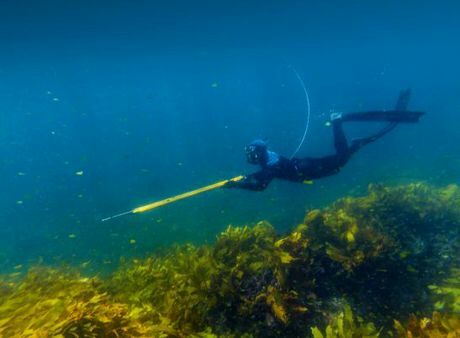 Much like building up a 4WD, decking yourself out for spearfishing is a pretty subjective thing, often dictated by where you dive and the fish you're targeting. So let's look at some of the main items you'll need for your next dive. Handspears are a great place to start out, if for no other reason that they're generally a fair bit cheaper than a speargun and can fold up so they're relatively compact, which is great when space is at a premium in the back of the 4WD. Many divers keep one in the rear drawers along with a mask and fins in case they come across a spot that looks too good not to dive. 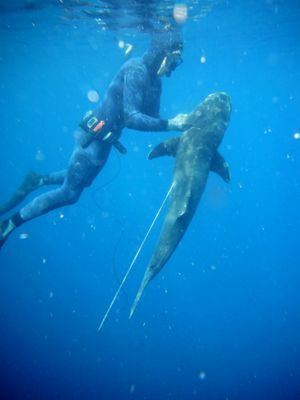 Spearguns are generally noted by their length. The longer the gun, the more the rubber has to be stretched on the spear, the faster the spear travels when it's released. Most folks start off with a cheap gun around the 900mm mark. These are great for diving reefs as the shorter barrels are easier to manoeuvre around kelp and into cave mouths. Power becomes a limiting factor for taking bigger fish. When you're ready to progress onto deeper blue water diving, you may want to step up to a quality longer speargun around the 1400mm mark. 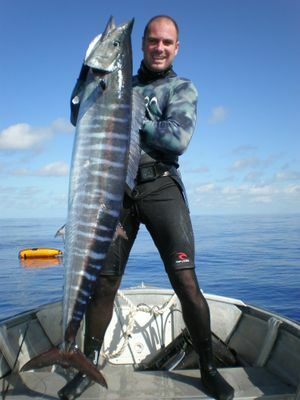 These are good from anything from Kingfish to Spanish mackerel and Tuna, but they're more tiring to use and the extra power can be a hindrance in close rocky dives as the spear can travel right through the fish and impact a boulder, generally resulting in a buggered spear - sometimes less is more. 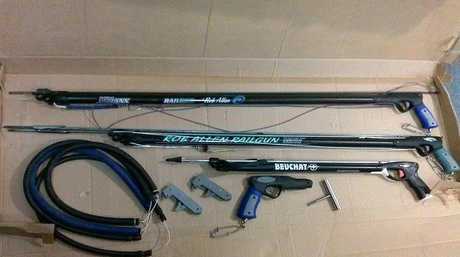 For a good all-rounder, spend a few hundred dollars on a speargun around the 1100mm mark. These offer a good compromise between maneuverability and power and can often be equipped with extra rubbers, making them somewhat tunable to the conditions. When you're shopping for a mask try a few on before you buy. We all have different shaped faces and what works well for your mate may leak like a sieve when it's on your melon. A good test is to fit it on your face with the strap hanging loose, breathe in through your nose to create a suction effect and then tilt your head down towards the ground. If the mask stays on it's probably suitable to wear underwater. Before you take it diving, give the mask a wash in warm soapy water to remove the factory lubricants that make it look good while it's on the shelves, and give the lens a good rub over with non-gel toothpaste to prevent it from fogging up. Snorkels are pretty much universal. Some have a splash guard on top to prevent waves from breaking on top of them and you copping a mouthful of sea water, but as long as it's comfortable in your mouth and clips to your mask without getting in the way, you're good to go. Stiffer fins move you faster through the water, whereas softer fins are less difficult to use. It's always going to be a trade-off, the trick is finding the balance you're comfortable with. But it's worth taking the time to get it right as a good pair of fins will transform your diving experience. 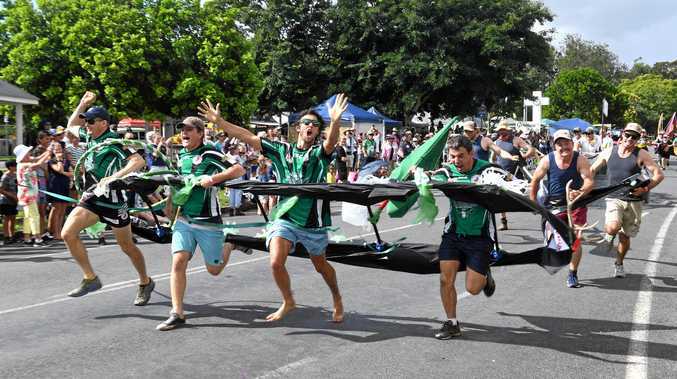 A float is a buoyant device that's brightly coloured and has a visible dive flag affixed to it. They include a length of rope (usually 10-30m) that's attached at the other end to the speargun or weight belt of the diver. Not only do they let boats in the area know you're underneath them, but they can also be rigged to hold things like fishing licenses, water bottles, speed spikes (used to hold your fish) and any number of other things. This one will depend on where you live. If the water temps in your area are usually up in the mid-20s to low 30s, throw a rash vest on to keep from getting burned and jump in! If you have to deal with water temps in the low-teens around winter time, then have a look at a good open cell 3.5mm number with a hood to keep your melon from freezing. Expect to pay $200-$350 depending on brand and quality. If the water in your area gets colder then consider stepping up to a 5mm suit, but for the majority of Aussies, a 3.5mm will allow comfortable diving year round. These will make staying on the bottom easier and diving more enjoyable. How much weight to use is highly subjective. If you're battling to stay on the surface you're using too much. If you're battling to stay on the bottom you're using too little. The rule of thumb is to have the amount that sees your legs pushed a metre or so under while your top half stays just under the surface with little effort. Oh, and don't forget the quick release, one-hand buckles. If you need to surface quickly then you don't want to be mucking around with traditional belt catches. Don't spend more than twenty bucks here. Why? Because you're almost guaranteed to lose it. They're important to have, both for humanely dispatching your fish and for cutting your float rope if you find yourself tangled up in it. While you don't need a dive watch, a lot of spearos find them handy for measuring things like dive time and water temperature as well as a host of other functions. Quality units aren't cheap, but they're usually worth it to their owners. Again, not totally necessary nor cheap, and they're not even 100% proven to work. But if wearing one gains you those precious few seconds needed to get back to the boat or shore - it's more than paid for itself. Some swear by them, some reckon they're a waste of time. Being relaxed when you're in the water will do more for your catch rate than just about anything else. Getting your heart rate down while diving comes with time and experience, but once you're comfortable and relaxed the fish will be that much easier to find it's not funny, and don't be afraid to spend a bit more time on the surface between dives. You may miss out on a couple of fish but it's way safer and will make you a better spearfisher long term. In times past, divers would breathe in and out at a rapid rate (hyperventilate) in order to saturate their blood with oxygen - in recent times this has been proven to not work. We like nothing more than taking enough for a feed before swapping the speargun out for a camera. A good trick we've learned is to take three deep breaths in and out while still on the surface to expand your lungs. Then a final big breath and hold it before commencing your dive. As you descend, make sure you equalise the pressure on your middle ear. This is done by holding your nose shut and gently exhaling through it which will equalise the pressure on your eustachian tubes, allowing you to descend without risk. Remember not to try and equalise on ascent, just when going down. When you're on the seabed, have a swim around and familiarise yourself with the surroundings. Check out any holes in the rock for lobsters, keep an eye out for any flatties hiding under the sand and enjoy the local fish life. We like nothing more than taking enough for a feed before swapping the speargun out for a camera. You'd be amazed what you'll find down here! The great thing about living on a big old island like we do is that there's no shortage of spectacular coastline to explore. Just about every headland or reef system in the country will have a heap of fish living nearby. 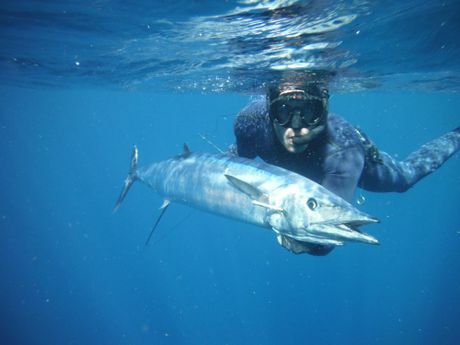 Or if you're ready to tackle some blue water you could always book in that Coral Sea trip and take on the big Spaniards, Wahoo, Cobia and Tuna. Talk to your local dive shop and go to club meetings (joining a club is a great way to get some great experiences with those in the know) to find out where the fish are and what the local conditions are - in certain places timing the tides and being aware of the current can make all the difference. No matter where your experience level is at, you do have to get out there and get in the water. But trust us, after you've been once you'll be looking for excuses to go. 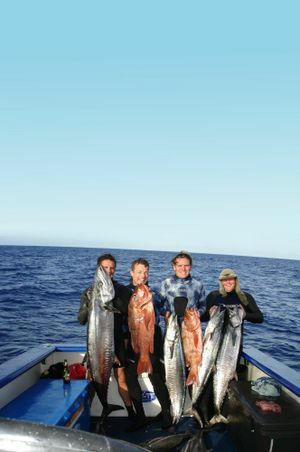 One last thing to remember is that it's important to always go spearfishing with a mate. This is commonly called the buddy system and is an important safety aspect to the sport. The tried and true method is the one up one down methodology which means that your mate is on the surface keeping an eye out when you're diving down. There are a fair few reasons to do it this way, most prominently a danger known as shallow water blackouts, which is when your brain isn't receiving enough oxygen and consciousness is lost, usually as the diver is ascending and they're only a couple of metres under the surface (hence the name). By having a dive buddy on hand you're effectively eliminating the risk, not to mention you'll need someone to back up your story about how big that Kingfish was when you're both down the pub later.